"College of Law" redirects here. For the Australian law school, see The College of Law (Australia). For the British university previously known as the College of Law, see University of Law. In Brazil, the legal education begins between 1827/28 in Olinda/PE and São Paulo/SP where the first schools of law were established by the new Empire using the Coimbra Faculty of Law as an educational model. The current legal education consists of a 5-year-long course after which the scholar is granted a bachelor's degree. Before practicing as public attorneys, public prosecutors or magistrates (judges), candidates must successfully pass an entrance examination and complete a constitutionally-mandated three years of legal experience. Second degree courts and higher must have at least one-fifth of their judges be members of a lawyers' association, and also from federal/state/labour prosecutors (ministério público) regarding the court jurisdiction. [clarification needed] Electoral and military courts do not have this requirement. After achieving the bachelor's degree in law, it is possible to specialize (lato sensu) or to follow an academic law path (stricto sensu), or both. The stricto sensu postgraduate program consists of a master's degree, which is usually a two-year degree, followed by a doctorate degree, which can take up to another four years. In the United States, law school is a postgraduate program usually lasting three years and resulting in the conferral upon graduates of the Juris Doctor (J.D.) law degree. Some schools in Louisiana concurrently award a Graduate Diploma in Civil Law (D.C.L.). To gain admission to a law school that is accredited by the American Bar Association (ABA), applicants must usually take the Law School Admission Test (LSAT),:33 and have an undergraduate (bachelor's) degree in any major. :38 Currently, there are 203 ABA-approved law schools that grant the JD degree. 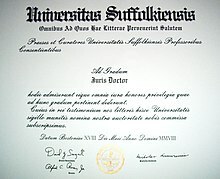 There currently are eight law schools that are unaccredited by any state bar or the ABA but registered by the State Bar of California, 21 law schools accredited solely by the State Bar of California, 2 law schools accredited solely by statute in Alabama and 1 law school accredited solely by the Massachusetts Department of Higher Education. Non-ABA approved law schools have much lower bar passage rates than ABA-approved law schools, and do not submit or disclose employment outcome data to the ABA. ^ "OAB - Ordem dos Advogados do Brasil - Conselho Federal". oab.org.br. ^ Capes, Coordenação de Comunicação Social da. "Legislação específica". www.capes.gov.br. Archived from the original on 2016-05-04. ^ Canadian law school concentrations, certificates and joint-degree programs "Archived copy". Archived from the original on 2017-05-10. Retrieved 2017-04-17. CS1 maint: Archived copy as title (link). ^ Where Law and Pedagogy Meet in the Transsystemic Contracts Classroom "Archived copy". Archived from the original on 2013-07-23. Retrieved 2016-05-08. CS1 maint: Archived copy as title (link). Accessed April 26, 2013. ^ Law Society of British Columbia PLTC "Archived copy". Archived from the original on 2009-01-18. Retrieved 2009-01-04. CS1 maint: Archived copy as title (link). ^ "Law Society of Upper Canada Law Licensing Process". Archived from the original on 2009-01-10. ^ University of Toronto. law Archived 2009-01-23 at the Wayback Machine. Accessed April 7, 2008. Queens University. Memorandum, Law Students Society[dead link]. Accessed April 7, 2008. ^ University of Toronto. Faculty of Law: Prospective Students Archived 2011-08-28 at the Wayback Machine. Accessed April 7, 2008. ^ NYU/Osgoode Joint LL.B/J.D. "Archived copy". Archived from the original on 2008-05-18. Retrieved 2008-06-19. CS1 maint: Archived copy as title (link). ^ University of Windsor / University of Detroit. J.D./LL.B. Program Archived 2008-02-16 at the Wayback Machine. Accessed June 1, 2008. ^ Michigan State University School of Law and the University of Ottawa. Joint J.D. – LL.B. Degree Program Archived 2008-05-09 at the Wayback Machine. Accessed June 1, 2008. ^ "Advocates Act, 1961" (PDF). Bar Council of India. Archived from the original (PDF) on 2008-08-19. Retrieved 2009-06-10. 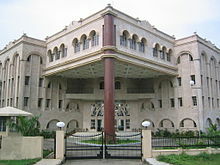 ^ "SRI LANKA LAW COLLEGE". Archived from the original on 2010-08-29. ^ a b "Laws & Regulations Database and The Republic of China". law.moj.gov.tw. ^ Kitroeff, Natalie (24 February 2015). "The First Two Law Schools to Drop the LSAT Could Be Just the Beginning". Bloomberg Business. Archived from the original on 7 August 2015. Retrieved 24 July 2015. ^ a b "Admissions and Student Services" (PDF). American Bar Association. Archived (PDF) from the original on 12 May 2015. Retrieved 24 July 2015. ^ "State Bar-approved law schools". ^ "Unaccredited registered schools" (PDF). State Bar of California. ^ a b c d Simkovic, Michael; McIntyre, Frank (13 April 2013). "The Economic Value of a Law Degree" – via papers.ssrn.com. ^ Solomon, Steven Davidoff. "Debating, Yet Again, the Worth of Law School". Archived from the original on 2017-07-09. ^ Matthews, Dylan (18 July 2013). "Ignore the haters. Law school is totally worth the cash". Archived from the original on 23 August 2017. ^ Weissmann, Jordan. "Is Law School a Good Deal After All?". Archived from the original on 2016-12-20. ^ "Brian Leiter's Law School Reports". leiterlawschool.typepad.com. Archived from the original on 2015-05-02. ^ "Who's Got the Biggest Salary?". 30 July 2012. Archived from the original on 6 October 2014. ^ a b c "NALP - National Association for Law Placement - Class of 2011 Has Lowest Employment Rate Since Class of 1994". www.nalp.org. Archived from the original on 2015-04-13.